The City of Vancouver’s Greenest City Action Plan is a strategy for staying on the leading edge of urban sustainability, and includes a much anticipated Organics Disposal Ban, which took effect on January 1st, 2015. The ban prohibits organic materials from entering the region’s landfills. Hollyburn has a long history of commitment to sustainable green living. Every apartment building we acquire undergoes a thorough environmental evaluation, with substantial capital expenditures to replace outdated boilers, systems, and appliances with state-of-the-art, high-efficiency and low-consumption models. Check out the incredible environmental impact that Hollyburn residents have made to date by diverting their green waste. (Data from Growing City available for Vancouver only, from March 1st – July 31st 2015). 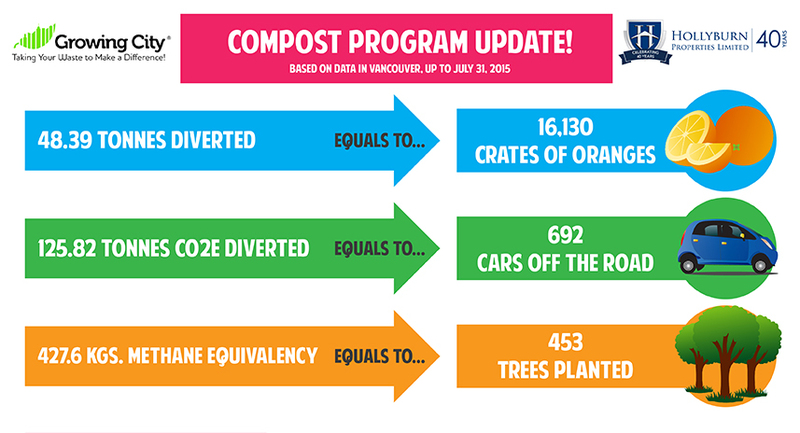 Stay tuned for future Hollyburn Compost Program updates!